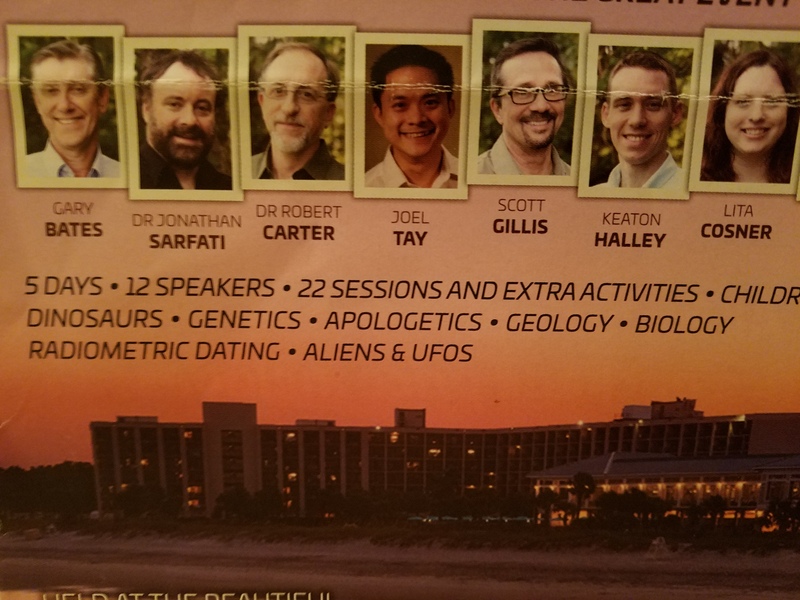 This summer I had the pleasure of traveling to a number of locations for creation conferences, ranging from Myrtle Beach, South Carolina, to Pittsburgh, PA. These events have been quite valuable because the speakers are presenting some of the most current research in science, and it provides an opportunity to meet those scientists who’s work I’ve been following for years. These scientists interpret the evidence from a Biblical perspective rather than an evolutionary one because they believe the book of Genesis is a true, historical account of our origin as revealed by God. I normally keep my posts to a page or two, but this one is a little longer because I wanted to close out my series on this year’s Creation Superconference. Here I’ll provide a brief summary of six sessions, and if you have time to check out each one, that’s great, but if not, just scroll down to see which one catches your interest the most. Gary Bates: Deep Time Deception. The CEO of Creation Ministries International reminds us that the age of the universe has been established by science many times over. According to the secular scientific establishment, the universe was once believed to be 5 billion years old. But that wasn’t enough time for evolutionary processes, so the consensus became 10 billion. But that still wasn’t long enough, so it was changed to 15 billion, then 20 billion, and today it’s believed to be 13.8 billion years old. This consensus keeps changing according to convention… not reality. The problem is that no one independently knows the age of the Earth or the universe simply by doing a mathematical calculation or reading radiometric data. Any interpretation is based on unknowable and unprovable assumptions about the distant past that cannot be confirmed. Rocks of known ages, for instance, are always returned with inflated ages- rocks from Mt. St. Helens, for example, have been dated at 2.8 million years; obviously, this age cannot be true because the volcanic eruption was first observed and documented in 1980. But what about the Bible? The Biblical model is based on God’s first-hand revelation. Atheists, of course, reject all religious claims. But there are also skeptics who deny the reliability of Scripture, and there are Christians who interpret Scripture differently. There are Old Earth Creationists, Day Age creationists, those who believe in the Framework Hypothesis, Progressive Creation, Allegorical, etc. For those who don’t believe in a literal interpretation of Genesis, Bates explains that there are over 100 references to Genesis in the New Testament. Therefore, not only is creation an important issue- it’s foundational, serving to support the rest of the Bible. The genealogies in Scripture, for example, connect Jesus to a literal Noah and Adam. Another major problem with old Earth thinking is that students are not being properly educated. Instead of being taught how to think, students are being taught what to think. They’re not allowed to consider the evidence and make up their own minds because the courts have stifled science on political and religious grounds. In conclusion, Bates explains that the real issue isn’t the age of the universe, but what the Bible says, and whether we accept it as authoritative. The observational evidence is consistent with Biblical creation; that means we don’t need to accept deep time. Instead of questioning our interpretation of the Bible, I think we’re better off questioning how the evidence is interpreted. Dr. John Sanford: The Evidence of Our Declining Genes. This is an area I’ve been fascinated by because it demonstrates the exact opposite of what we’d expect if evolution were true. There’s no gradual process that can turn non-living chemicals into a human over millions or billions of years. The truth is, the genetic information contained in all living organisms is subject to decay. Our fitness is going down, not up; we’re experiencing degeneration in each generation because energy dissipates, flowing to its lowest energy state. This describes the second law of thermodynamics, which is one of the most fundamental laws in science. Apart from physical intervention, the information contained in our DNA will eventually become corrupted. Dr. Sanford explains that from a Biblical perspective, this makes complete sense because all living organisms were created with a perfect blueprint from the beginning of creation without any genetic mutations at all. It wasn’t until after The Fall that all living organisms became subject to decay; everything is now wearing out. This explains why humans, for example, are producing offspring with more and more genetic mutations from one generation to the next rather than evolving into a super species. About 2-3% of newborns have visible birth defects caused by mutations, and there are thousands of genetic diseases. Most defects are subtle, but have an accumulative affect, taking time to unfold. Population geneticists understand that the genome is subject to decline, and none deny this degeneration because it’s apparent for anyone to observe. Dr. Sanford pointed out another important observation, and that’s a genetic bottleneck in the human population that evolution doesn’t account for. Creationists account for this in Noah’s flood, and since that event, the human population has exploded. The only reason we live longer today than people from a couple hundred years ago is due to advancements in medicine and technology. However, according to Darwinian theory, evolutionists expect a reverse of entropy, hoping beneficial mutations will produce offspring better adapted to survive. But the problem is that natural selection can’t reverse entropy, nor can it recognize mutations and correct them. Each generation still has more mutants than the previous generation. Dr. Sanford referenced a numerical simulation program called Mendel’s Accountant which allows for the modeling of genetic change over time, and it demonstrates a decline in fitness in a systematic way. The program successfully analyzed the human H1N1 influenza virus since 1918 and Lenski’s bacteria, and they found that no new genetic information was created. Some beneficial mutations were discovered, but they resulted in a loss of function because they involved deletions when the organism adapts to a new environment by getting rid of genes and functions that are dead weight. These examples are reductive evolution, or devolution. Genetic entropy is very real and supported by the laws of nature, and is based on compelling logic. All life is running down, so the history recorded in the Bible makes the most sense of the data when we realize all life must have started out with a perfect genome and no mutations. In fact, the amount of mutations accumulated since Adam and Eve can be traced within a Biblical timeline. And with allele distributions, we can show that two people actually could give rise to the genetic diversity we see today, as well as the current shape of our human population. Dr. Jonathan Sarfati: Noah’s flood and the evidence for it. The Bible describes this event as a historical, worldwide catastrophe that wiped out all life on land. Only Noah and his family survived on board an ark, along with the various animals brought on board. There’s overwhelming evidence for a worldwide flood, yet some scientists reinterpret that evidence in favor of a secular belief system that affirms millions and billions of years. Just a few examples of evidence include rapidly formed geologic layers, wide and thick sediment layers reaching across continents, and little time for erosion between layers. We have examples of soft organisms- like jellyfish- being preserved in the fossil record (even though Darwin claimed such organisms couldn’t be preserved). We have examples of organisms being rapidly buried, like an Icthyosaur giving birth, and another fossil of a fish in the process of eating another fish. Evidence that the flood happened recently include dinosaur soft tissue preserved with organic material, including blood cells. It’s impossible for such material to survive millions of years, so a recent flood makes perfect sense. We also have evidence of dinosaurs treading flood-water, as if they’re attempting to escape to higher ground. These footprints had to have been preserved rapidly. It’s also interesting that dinosaur footprints occur in one layer, and then the dinosaur fossils in layers supposedly formed millions of years later. Spike Psarris: The Heavens Declare the Glory of God. Here Spike presented a host of problems with modern secular cosmology, including the Big Bang. There are problems with the belief that planets form from gas clouds into dust. Secular scientists admit much of this process is not understood, it’s puzzling, and is a fundamental unsolved problem in planetary science. Jupiter is our largest planet, yet scientists know next to nothing about how or where it formed. According to current models, Jupiter shouldn’t be there, and Uranus and Neptune shouldn’t exist because they’re so far from the sun. Some evolutionists attempt to count for this by resorting to quantum gravity, but the problem is that physicists don’t have a quantum theory of gravity. Therefore, other evolutionists propose that the universe is eternal. But that can’t be possible either because, if it were eternal, then we wouldn’t exist. The entire universe would have experienced a heat death long ago. The fact that the sun and stars haven’t cooled off is evidence that the universe is not eternal. Even an oscillating universe doesn’t resolve these problems. This creates a dilemma for secularists because they have to pick a model, but each one they choose violates certain laws of physics; therefore, they must choose which part of physics they wish to violate. Of course, if one wishes to violate the laws of physics, affirming a supernatural creator very neatly solves the dilemma, and that is the most logical solution. Spike touched on the fine-tuning of the universe, explaining how the universe and its laws are perfectly set for our existence, and if it were not so, then we wouldn’t exist. Once again, God’s existence provides a logical explanation as to why we exist. The multiverse theory is another popular rescuing agent for secular scientists who wish to keep God out of the equation. According to this idea, there are an infinite number of universes, and we just happen to be living in the one that works. How convenient. There’s not a shred of credible evidence to support it because multiverses aren’t detectable. But, as Bernard Carr said, “If there is only one universe, you might have to have a fine tuner. If you don’t want God, you better have a multiverse”. And then there’s the belief that aliens are the intelligent source responsible for life on Earth. But, once again, there’s no evidence for this except for personal philosophical reasons and the need to avoid God, which is not rational. Believing in God, on the other hand, is perfectly rational and makes the most sense. As Spike said, this is not about religion vs. science because science is on our side. Keaton Hailey: Can we be good without God? To begin, Keaton claims that moral facts do indeed exist. There is objective truth built on the foundation of reality, and then there’s subjective truth, which describes your favorite flavor of ice cream. However, if God does exist, then there is a standard of right and wrong above human preferences. Morality, then, is no longer relative. In reality, moral relativism is not a type of morality, but is a denial of morality. Hailey explained, without a standard, one cannot judge the behavior of others as good or bad, and if there are no moral laws, then it’s impossible to break one. One is not bound to act morally if we have no moral obligations. Terrorists and serial killers are morally free to do as they please. They just need to get away with their acts by any means necessary. The truth is, people give lip-service to relativism, but few really live it. Atheism and humanism attempt to account for morality by claiming it’s a survival mechanism; they claim that cooperation and agreeing to moral standards leads us to produce offspring that will survive. Of course there’s no good reason to adopt social Darwinism’s survival of the fittest mentality. But if we evolved from animals, why do we find such immoral behavior to be abhorrent in the first place? How did we evolve the concept of right and wrong, shame and guilt? Where did this radical change in behavior come from? Is it simply that ‘nature’ did it? That those first, early humans who began cooperating had a survival advantage over animals that didn’t? But we still come back to determining how we know the difference between right and wrong. We might be sad when a hawk swoops down, grabs a rabbit off the ground, kills it and eats it, but we know it wasn’t morally wrong for the hawk to do such a thing. So, why do we think it’s wrong for one human to murder another human? Is such morality and behavior simply a mechanism of self-preservation, or is murder wrong? Is it morally, ethically and objectively wrong? Could we even go a step further and ask if murder is sinful? Or is it simply a convention based on societal agreement? I think most people ‘know in their heart’ that murder is wrong. This isn’t simply conventional wisdom. There’s a reason why we want and demand justice when an innocent woman or child is brutally raped and murdered. There’s a reason why such atrocities penetrate our soul. But atheism can’t account for this type of morality, and that’s because only God can be the source of moral facts. All laws have to come from a source of authority, and God is the ultimate authority by whom all morality is measured. Dr. Rob Carter: the Biblical age of the Earth. This goes to the very heart of Biblical creationism. Why would anyone believe the earth is young when “science” has “proven” that the universe is 13.8 billion years old? The idea that the Earth is young is not a new concept. The truth is, if God is real, then humans have believed in a young Earth since the beginning of creation. If Adam and Eve were the first two humans to exist, then they had a pretty good idea as to what God did and when he did it. But more to the point, throughout the ages, people like Isaac Newton, Johannes Kepler, Arch Bishop Usher, Saint Bede, John Lightfoot and others have derived a young Earth based on Biblical data. Young Earth creationism has been around for a long time because the Bible reveals our origin and describes it as a historical event; the Bible even provides chronologies and genealogies that give us clues. In order to arrive at an accurate date, Dr. Carter considers various factors. We want to determine the oldest possible age supported by the Bible, as well as the youngest age. How much wiggle room do we have, and what assumptions must we make? When considering chronologies, we can lose a year from one generation to the next. Even if we know how old someone was at a particular moment in history, there’s still some ambiguity that must be dealt with when interpreting the Biblical text. The Bible mentions how old someone was when they had a child, but such a chronology will inevitably produce a margin of error that must be accounted for. It’s also important to consider whether a certain statement in the Bible was general or specific, or if numbers were being rounded up or down. Were the Biblical authors using a regnal year or an accession year, or a tropical year verses sidereal years? Does it matter whether the time of year was spring or fall? Were all the authors consistently applying the same standard? And what calendar is being used? It’s also necessary to consider historical accuracies that may be unknown or incorrect. In any given system of measurement, there’s always some element of uncertainty. There also may be other unknowns or assumptions that haven’t been accounted for. What texts are being used for the calculations? Based on all these factors, the youngest date for creation could have been 3822 BC, but a more reasonable date would be 4,220 BC, while the oldest age would be around 5655 BC. Therefore, the Earth is probably less than 7,500 years old (give or take a couple hundred years). Thanks, it was a real pleasure meeting them and getting to know them. They’re all really down to earth and very helpful.